There are a lot of reasons why it’s time to switch to digital signage, but reaching your young customers is probably near the top of your list. Whether it’s because millennials make up about 25% of the U.S. population, are the first generation to not know a world without the Internet, or because many of them have more disposable income than other generations, this is a generation you want as customers. Whether you think millennials want too much instant gratification or are one of the hardest-working generations yet, it’s safe to say this young adult demographic are leaders in the current-day economy, tech trends, and content creation and consumption. 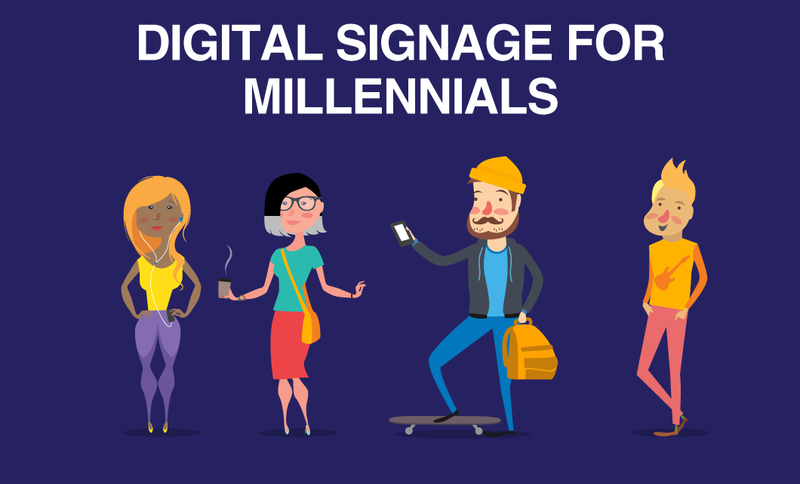 Below are 7 reasons why you should be using digital signage to reach millennial audiences. 1) Millennials are tech trendsetters. Most millennials have grown up with computers and the Internet. While the younger generation of millennials have never known a screenless world, the older generation got access to mobile phones and laptops in their teens or college years, making both groups naturals when it comes to all things tech. According to one report, 56% of millennials say they are usually either one of the very first to try new a technology or are among the first group to try a new technology. They are 2.5 times more likely to be an early adopter of technology, compared to other generations. Since screens are where millennials are most comfortable, digital signage is no longer an opportunity to go above and beyond — it’s expected. They are used to getting their information from displays, so it’s time to stop missing out on reaching this influential demographic by taking advantage of the tools free digital signage software offers. 2) Millennials have a strong influence over purchasing decisions. In addition to being on top of technology trends, millennials have a lot of economic influence. It’s reported that millennials make up 21% of consumer discretionary purchases, which is estimated to be over a trillion dollars in direct buying power. 3) Millennials want content tailored to them. Being a generation that’s potentially both spoiled by technology and extra productive because of technology, millennials seek out content suited to their specific needs. They want to be prepared and have as much information as possible, which makes them the perfect audience for digital signage. Even though you can include a lot of information on your digital signage, it’s important to keep your messaging and imagery clear and purposeful. The beautiful thing about digital displays is the ability to present content thoughtfully on a schedule or on different monitors/TVs, so you’re not left presenting an information overload to your young customers who, frankly, don’t have the time to soak in too much. Using a free digital signage software solution allows you to display your content in a more readable, visually-appealing way. Because millennials seek out content digitally, important or urgent information can be shared quickly to the exact place they’ll be looking for it. 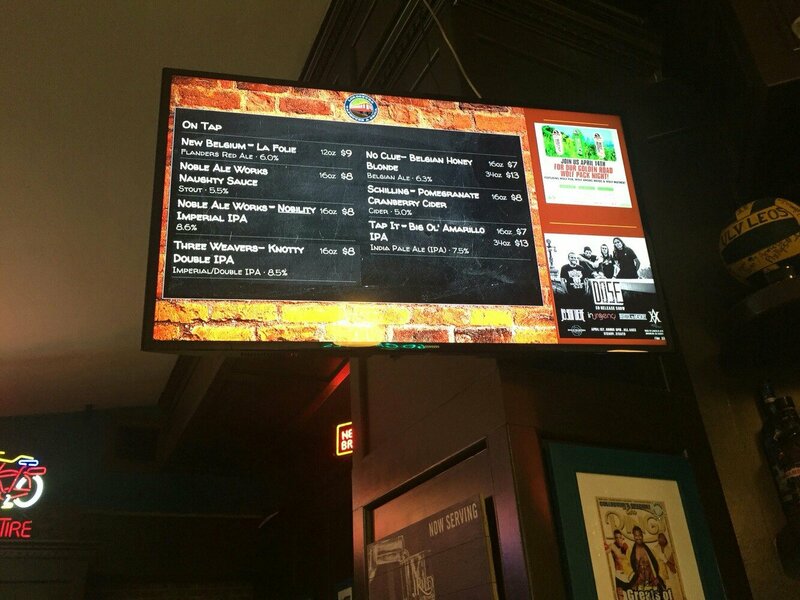 A simple change made using digital signage software gets your message out exactly how, when, and where it’s needed. You, as the organization, benefit by being more useful and reliable to your customers, and your customers benefit through the time saved not having to research the information they require. 4) Millennials are all about getting social. You’re likely already communicating with and like millennials on your social media channels. Your hashtag game is strong, you’re starting to nail the lingo, and you rock the heart eyes emoji better than most. Your millennial customers are talking about you online — they’re tagging you when they visit your location and posting photos of your venue, food, or products. Sharing their social content — and your own — on your digital signage is a way of recognizing and saying thanks to your customers and community. It also ups your visual ante! How many posters and menus have you seen advertising Facebook, Twitter, and Instagram logos with a bold call to action saying, “Like us on Facebook! Follow us on Twitter and Instagram!”? You can do so much better. Your social media strategist is already writing and developing creative for Facebook, Twitter, Instagram, and any other channel you’re active on — why not share content? Use free digital signage software to ensure your social media presence is displayed and advertised on your digital signage, as well. 5) Millennials have a desire to collaborate and to be entertained. Now that we’ve established the importance of integrating your social media channels into your digital signage, let’s talk about how you can use these tools to engage with millennials and encourage social sharing. Millennials want brands to entertain them, but they also want to participate in your brand and the content you make. Almost half of all millennials post original photos or video online that they themselves have created — and there’s a huge opportunity for brands to get involved with or be part of this content. On top of sharing the great photos and videos your customers are sharing about your brand, you can encourage conversation by sharing your social media handles and an easy-to-remember hashtag. Displaying this kind of social content on your digital signage extends your brand, encourages followers and online engagement and helps your company be part of a bigger conversation with your customers. 6) Millennials want to give back — and they want you to do the same. Never has there been a better and easier way to communicate your company’s corporate social responsibility. Do you run an annual fundraiser or give back by volunteering time at a food bank or other community effort? Maybe your employees participate in a local run or walk for a cause or a global event like Movember. Digital signage is a great way to display progress toward a goal, a leaderboard, or to simply show off the great philanthropic causes your organization is involved in. Knowing more about the good you’re doing in the world is important to millennials. Almost 50% of millennials would be willing to make a purchase from a company if their purchase supports a cause. 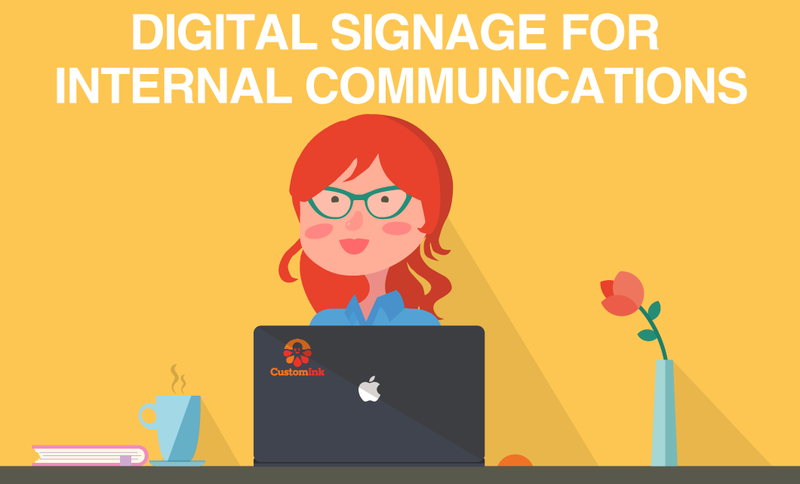 By displaying this information on your digital signage, you’re not only doing a better job of improving communication and being more transparent to employees and clients, you’re increasing the odds of growing your millennial customer base. 7) Transparency matters to millennials. Now, more than ever, customers want to buy from responsible companies and they want to be part of what makes a company great. This applies even more so for millennials, who feel a responsibility to share feedback with companies after a good or bad experience. Using your digital signage to collect, share, or simply promote that you want these experiences shared with you proves to your customers that you have a goal of being transparent. 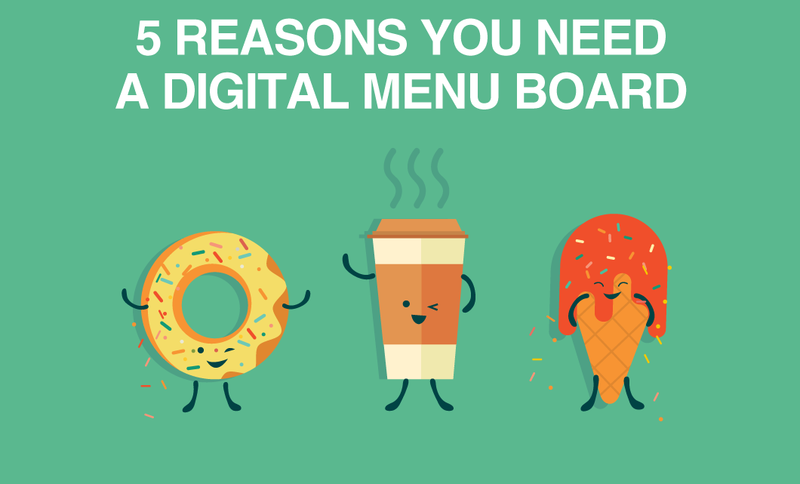 A free open source digital signage software solution allows you to feed in online reviews or even talk about more topics that matter to your millennial customers — like calorie count, vegetarian, vegan, and gluten-free options, where your food comes from, and more. If you’re waiting to switch to digital signage, the time is now. Digital signage software allows you to impress and draw in a variety of existing and new customers, but the digital desire from millennials should really be what tips the scale for your organization. Sign up now and start attracting these new customers today!